This is the only photo of my whole family in one place. (Usually, one of us was behind the camera taking the picture . . .) From left to right, me, Dad, Donna, Richard, Mom. 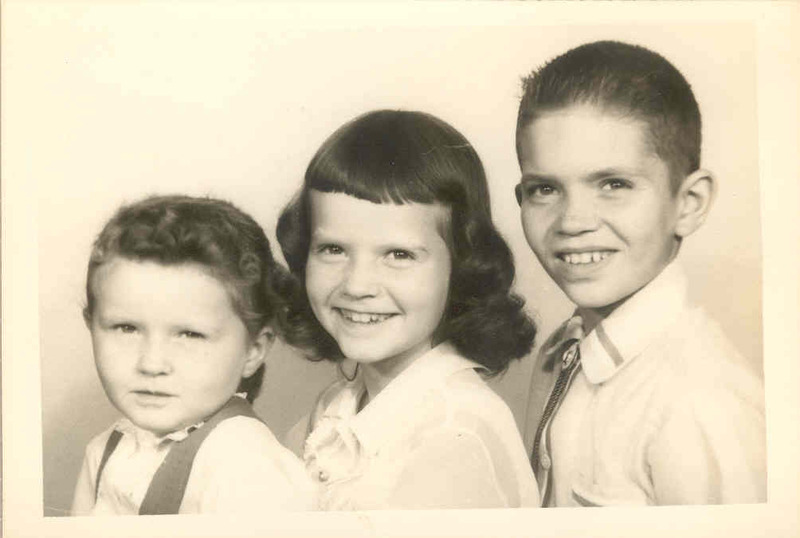 Donna, me (in 4th grade) and Richard. The 8th grade assignment that changed the way I wrote reports. 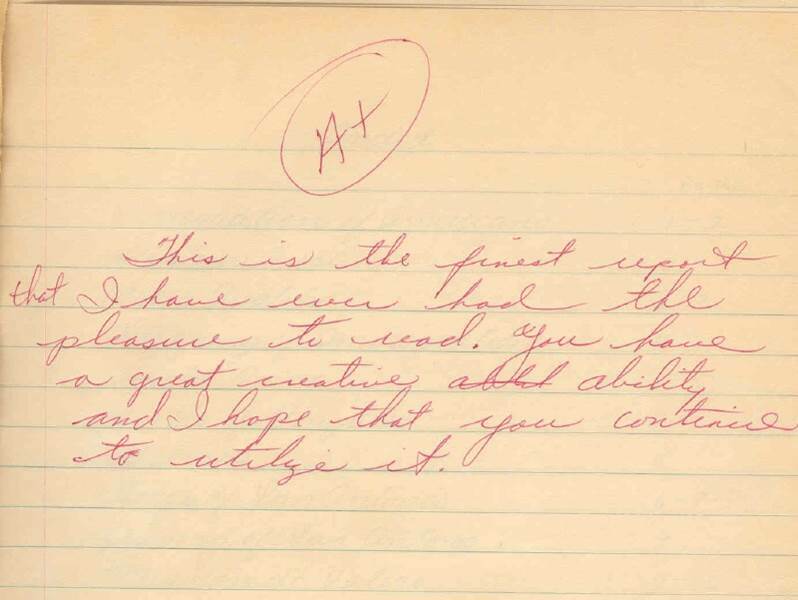 Reports used to be an excuse for me to practice penmanship. "This is the finest report I have ever had the pleasure to read. 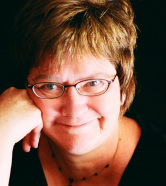 You have a great writing ability and I hope you continue to utilize it." Encouraging words from my 8th grade social studies teacher. I used to think that being a good writer meant that you had good penmanship. 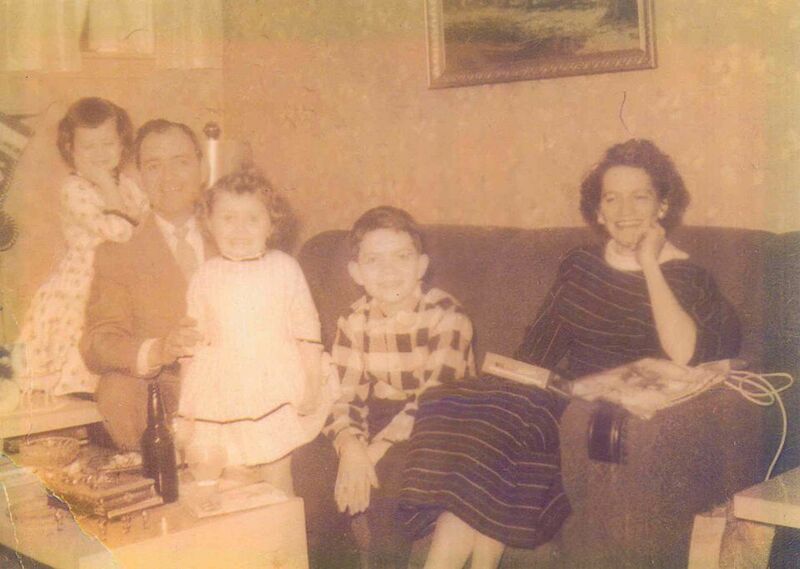 My luckiest day happened when I was born in Boston to parents with Irish (by way of County Cork) and Scottish (by way of Nova Scotia) roots who loved to sing and tell stories and jokes. My older brother, younger sister and husband are great joke-tellers. I am not. But I’m a good laugher, no matter how many times I’ve heard the same joke. I discovered, though, that I was good at writing things down on paper, so that’s how I ended up doing what I do now – writing books for kids. When we moved from South Boston to Wakefield, Massachusetts, I discovered my first profession: I became a teacher at the age of seven. My dad brought home a discarded blackboard from his factory and nailed it up in our garage. With some chalk and my mom’s old portable typewriter that came in a tailored suitcase, I set up for business, roping kids from the neighborhood into being my students. It was very satisfying. I decided that’s what I wanted to be when I grew up. And I did. My second profession started when I was in 6th grade: I became a writer. Only I didn’t realize this until much, much later. When my teacher, Mr. La Bossiere, read my report on Ireland (which was slightly fictionalized) out loud to the class and my classmates liked it, I knew I was on to something. Teachers applauded my creativity. Many read my writing out loud. Classmates complimented me. And I liked the feeling. I didn’t know then that I’d grow up to be a writer after becoming a teacher. But I did. And I love my life. So that’s the short of it. If you want to know the longer version with specifics, click here for my “official” biography. Thanks for stopping by. I hope we might meet someday! I believe in the power of books to connect hearts and heads and make us better people. I believe that knowledge is power. I believe that persistence pays off. I believe that children’s authors inspire readers and motivate change. I believe that art (writing, music, fine art, drama, dancing) saves. I believe that life is good.